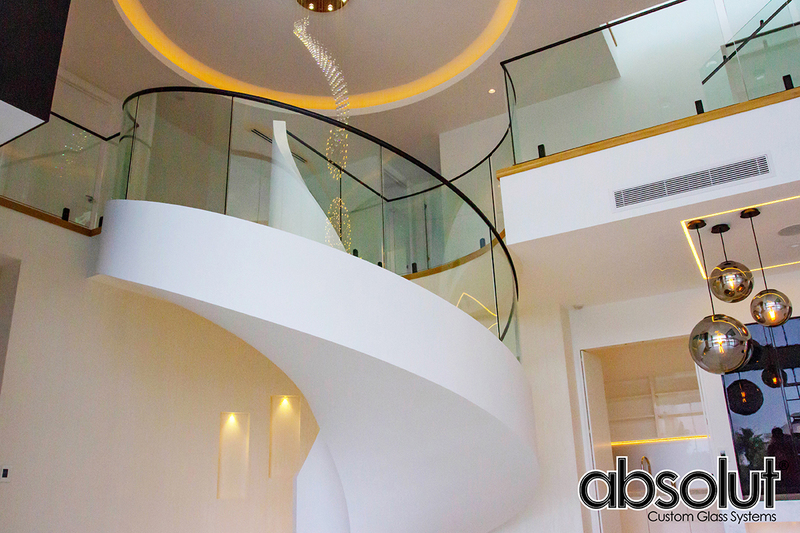 Absolut Custom Glass Systems are one of the few businesses that specialise in curved glass on the Gold Coast. Curved glass has many applications today and can be used for balustrades, spiral staircases, splashbacks, pool fences, shower screens, windows, wall panelling, display cases and much more. Curved glass offers a unique solution opposed to standard glass installations and when used correctly can greatly complement even the simplest of glass applications. Absolut also focus on ceramic frisk (painted glass) and offer big discounts on large glass projects which often save thousands of dollars in supply and installation costs. Curved Glass Gold Coast & Brisbane is a growing market that Absolut Custom glass systems have been well recognised for and chosen frequently as the preferred supplier and installer for many years. All glass work including curved glass is backed with a 10 year workmanship guarantee, and with a 100% customer satisfaction to date, it’s no surprise that Absolut Glass is today’s top choice for curved glass on the Gold Coast and Brisbane. Curved Glass Gold Coast & Brisbane – Absolut Custom Glass Systems, contact us today for a free quote.